When this homeowner made the decision to rebuild, he made sustainable solutions and energy efficiency a priority. The result was a cutting-edge new residence with a certification goal of LEED Platinum. The beautifully crafted home was built on the foundation of an ELAN smart home automation system attached to a SpeakerCraft MRA 664 whole home audio controller. The ELAN system installed in the Sunset Green Home is programmed to maximize the efficient use of lights, shades and drapes, ceiling fans, HVAC, and outdoor systems such as landscape lighting and irrigation, ensuring that all measures are taken to conserve energy without sacrificing comfort or convenience. The project was a finalist in the Sustainable Project of the Year category for the 2016 Mark of Excellence System Integrators Awards Program. The Mark of Excellence program recognizes the best in custom integration and installed technology each year. Learn more about applying for the program. Sunset Green Home uses connected green tech. One touch triggers this home automation system to jump into action, which is kind of like how one woman’s story inspired an entire group of leaders in the smart home industry to build a cutting edge home with connected green tech. “It was a way to make lemonade out of lemons, because we had just experienced this disaster, and we really wanted to do something that was special when we started to rebuild,” says homeowner Kim Erle. Erle and her family lost their 1940s-style cottage on the Hamptons during Hurricane Sandy. “We’re coming up on the third anniversary of the storm, so it’s been a very long time,” she says. It’s been a long time and a lot of effort, but the family’s house has been rebuilt and sort of reborn as the Sunset Green Home. “We really have built what we think is a house of the future, and we’re really excited to finally have the keys to it and begin to use it,” says Erle. Integrator Jeff Sakkal along with several manufacturer sponsors, the builder, architect and more used the Elan g! platform to create the ultimate connected, green home. Sunset Green Home uses solar, LEDs and a smart HVAC system. “When we were approached with the project, it’s something we jumped on immediately. It’s what we’ve been waiting to get for a very long time, to kind of merge the green concept with automation,” says Sakkal, president of Sakab Design Inc.
What’s so great about this automation system is that it can tell when the Erle family is coming home and pulling into the driveway, and it triggers all of the driveway lights to turn on. What’s even better is the LED lights throughout the home are only triggered when needed, which is only one small part of the Sunset Green Home’s energy-conscious technology. There’s also an efficient HVAC system that uses an air source heat pump and there are connected shades to shield the sun. “I can press a button and the shades will automatically come down,” says Erle. The Elan system controls the LED lights throughout the house. And because the envelope is so tight, you want to make sure you have fresh air in the house. Erle’s home has an energy recovery ventilator (ERV). “It brings fresh air in from the outside. It expels stale air from the inside in a balanced way, so exactly the same amount of air is going out as is going in,” she says. The Sunset Green Home was built two more feet above sea level than the current code requires, sits on 130 pilings and has impact resistant glass. Pre-planning allowed this complex green home project to run more smoothly than conventional construction. Shown are (from left) Elie Nackab and Jeff Sakkal of Sakab Design; homeowner Kim Erle, LEED AP; and builder Chris Mensch of Coastal Management. For many custom integrators, the green home building process generally has been a frustrating one. For some reason the value of energy-saving systems like lighting control, HVAC control, irrigation control and home automation has been under-rewarded in the point scales used to determine green homes. Indeed, it seems like the planting of a single cactus in the backyard of a green home is more valued than these vital electronic systems that can affect the daily lives of a home’s inhabitants. At the same time, home enhancements like multiroom audio and home theater are vilified by the green community as power-sucking extravagances. No more. The Sunset Green Home under construction in East Quogue, N.Y., illustrates how high-tech green technology and energy consciousness can peacefully coexist. The 3,600-square-foot home is a sustainable, energy-efficient construction project registered through the LEED for Homes (LEED-H) U.S. Green Building Council (USGBC) with the certification goal of LEED platinum. To achieve that lofty designation, it means the home must earn 80+ points for things like energy efficiency, water usage, recycling during construction, etc. The Southampton-area home incorporates sustainable products, materials, and technology into every part of the home and it includes solutions from multiple manufacturers, including a wide swath of equipment from Core Brands, including Elan, Panamax, SpeakerCraft, Sunfire and Xantech solutions. In total, Sakkal estimates about $100,000 worth of electronics. But those systems are key to achieving the long-term operational savings on utilities for the home. Sakkal’s commitment to always “think green” when designing a smart home system is what really impressed Kim Erle, LEED Accredited Professional (AP) on the project, when selecting Sakab Design as the integrator. Erle is not just the LEED AP on the project, she is also the homeowner. The decision to build a sustainable LEED certified home was made after the original 1940s-era beach cottage was damaged first by Hurricane Irene and then, devastatingly, by Hurricane Sandy. Erle became involved with the USGBC during the planning of the project. During the course of the planning, the Town of Southampton passed a 10-year property tax exemption for LEED-certified homes worth about $15,000. Construction industry estimates are that it costs 5 percent more to build a green home vs. a conventional abode. But Erle notes that green construction processes, like improved insulation, allow you to do things like install a smaller, less-expensive HVAC system than would have been necessary for a normal home. Also, the operational cost savings achieved on utilities over time play into decisions on certain equipment. This home broke ground in June 2014 and took 14 months to complete. From its inception in 2004, Sakab Designs has dedicated itself to meeting the A/V and smart home needs of its customers with solutions that are, wherever possible, eco-friendly. Sakkal thinks the Elan platform is the greenest solution out there. The Elan g! system being installed in the home is programmed to maximize the economical use of lights, shades/drapes, ceiling fans, HVAC, and outdoor systems such as sprinklers/fountains and weather stations. The system is designed to operate as a standalone lighting and shade control system or as part of a complete automation solution. This is one of the key solutions that earns valuable LEED-H points by enabling fixed or flexible daylight harvesting, fixture control, and subsystems scheduling (based on seasons, time, motion, occupancy, temperature, humidity and other conditions). However, the system is also flexible enough to employ other non-Core Brands subsystems. For example, the project uses Lutron lighting controls integrated into the Elan system. There is a lot more than just electronics imprinting this green project. The homebuilder is Coastal Management, led by Chris Mensch. It is his first LEED home. So in the end, how many LEED-H points will the electronics account for? It’s not that simple. Erle says she is chasing after 27 of the available 34 points in the Energy & Atmosphere category, but you can’t disaggregate individual systems with respect to how many points they earn. It is all based on the final operational efficiency result. For example, the shading and lighting controls don’t actually earn points, but you get points for LED lighting fixtures and bulbs, and for using Energy Star-rated ceiling fans and appliances. And for integrators who are looking for the green light to go green, this project serves as a sign that the numbers are starting to add up in their favor. For many custom integrators, the green home building process generally has been a frustrating one. For some reason the value ofenergy-saving systems like lighting control, HVAC control, irrigation control and home automation has been under-rewarded in the point scales used to determine green homes. Indeed, it seems like the planting of a single cactus in the backyard of a green home is more valued than these vital electronic systems that can affect the daily lives of a home’s inhabitants.At the same time, home enhancements like multiroom audio and home theater are vilified by the green community as power-sucking extravagances. No more. 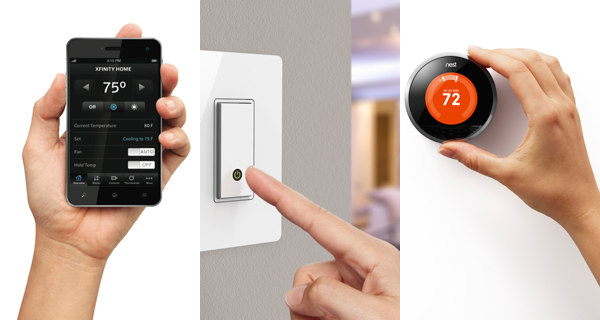 From left, the smartphone app for Xfinity Home, Belkin’s WeMo light switch and the Nest thermostat. A few years ago, I bought a $25 wall switch that could automatically turn my porch light on at dusk and off at sunrise, hoping to make my 1920s-era home a bit smarter. As leaders in the audio video industry, it was only a matter of time before Sakab Design Inc. would announce that they were going green. CEO of Sakab Design Inc., Jeff Sakkal emphasized that “Recycling alone is simply not enough anymore; we each need to do our part and make an impact for the future. Manufacturers are investing a tremendous amount of time and money considering new ways to advance products with more energy efficiency. It is only fair to pass these measures on to our clients.” Sakab Design Inc. wants to help you reduce the size of your carbon footprint on the environment. The American Dream is a wonderful ideal that brings with it children, a stable job, and usually a home. There are few events as elating as buying a house for the first time; it’s a signal that our formative years are over and our days as a productive member of society are about to begin. But it doesn’t take long before that elation wanes and we’re left with the reality of owning a home: It takes a lot of work! From mowing the lawn, cleaning the gutters, and scrubbing the floor, to making sure the house is properly heated, cooled, and secured, the many tasks associated with home ownership are seemingly endless.